Horace Silver is one of the last giants remaining from the incredible flowering and creative extension of bebop music that became known as "hard bop" in the 1950s. This freewheeling autobiography of the great composer, pianist, and bandleader takes us from his childhood in Norwalk, Connecticut, through his rise to fame as a musician in New York, to his comfortable life “after the road” in California. During that time, Silver composed an impressive repertoire of tunes that have become standards and recorded a number of classic albums. Well-seasoned with anecdotes about the music, the musicians, and the milieu in which he worked and prospered, Silver’s narrative—like his music—is earthy, vernacular, and intimate. His stories resonate with lessons learned from hearing and playing alongside such legends as Art Blakey, Charlie Parker, and Lester Young. His irrepressible sense of humor combined with his distinctive spirituality make his account both entertaining and inspiring. Most importantly, Silver’s unique take on the music and the people who play it opens a window onto the creative process of jazz and the social and cultural worlds in which it flourishes. Let’s Get to the Nitty Gritty also describes Silver’s spiritual awakening in the late 1970s. This transformation found its expression in the electronic and vocal music of the three-part work called The United States of Mind and eventually led the musician to start his own record label, Silveto. 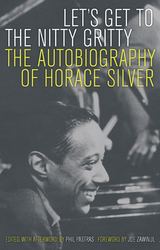 Silver details the economic forces that eventually persuaded him to put Silveto to rest and to return to the studios of major jazz recording labels like Columbia, Impulse, and Verve, where he continued expanding his catalogue of new compositions and recordings that are at least as impressive as his earlier work. Horace Silver was born in Norwalk, Connecticut in 1928. He now lives in Malibu, California. Phil Pastras is Assistant Professor of English at Pasadena City College and author of Dead Man Blues: Jelly Roll Morton Way Out West (California, 2002).